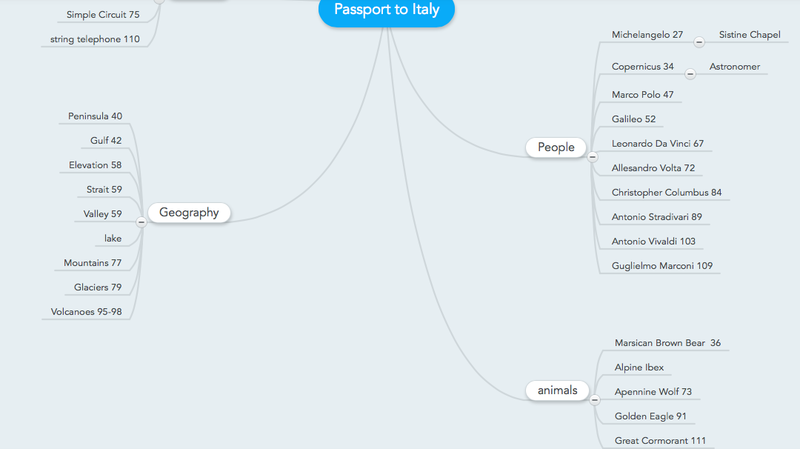 I have become a Mind Mapping fool! This program is so easy to use and has helped me to organize and plan out every part of my life, especially our homeschool. I originally heard about this program through another homeschooling friend of mine, but I had dismissed its value for a long time. You see, I am very linear and just the thought of mind mapping seems very…well, flowery. I took one look at her mind map, and thought, “No way! That’s not for me!” But a voice in my head (thank you, God) told me to try it out. I did and I’m hooked! My maps are not as flowery and pretty as her maps. I have naturally given mine a linear look and feel. This map is printed and pinned to my bulletin board for quick reference during the day. These games are from Right Start’s Math Card Games book. This fall, we are memorizing our addition and subtraction math facts. Drills and timed tests can get pretty boring, so I have organized the games in the book for easy reference. For this unit we are studying Italy, then moving backwards in time to study the Roman Empire while we read Detectives in Toga. I have created 4 different maps for our Roman Empire Unit Study. 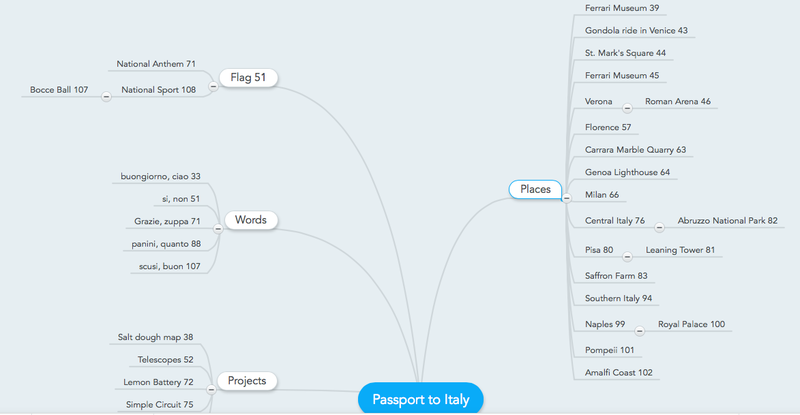 In this map, I have organized the Passport to Italy Unit Study by Amanda Bennet. It was taking us entirely too long to go through this study, so now I can use this map as a quick reference to pick and choose the topics I want the kids to cover. This map is huge and does not fit on my screen, so I have taken 2 snapshots of it. 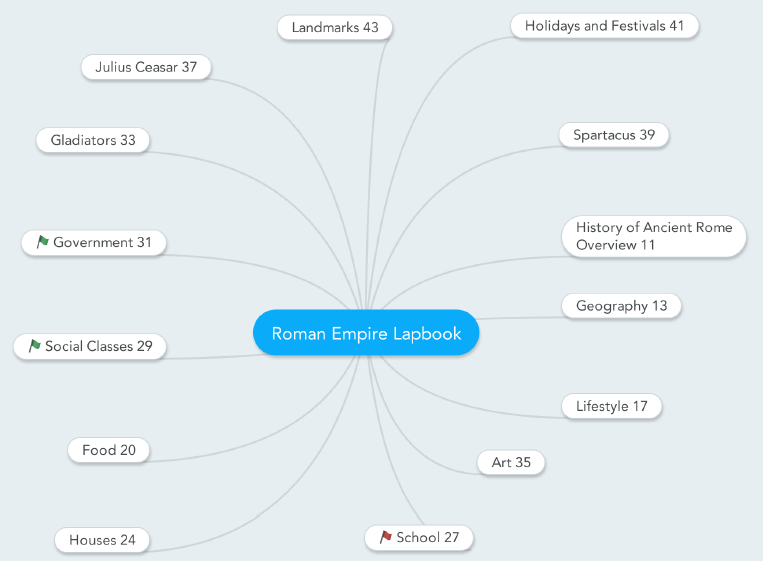 The next map I created is based on a Roman Empires lapbook that I purchased from CurrClick. We will be making this lapbook after we finish the Italy study. We will need to complete some of these topics before we begin our literature book, Detectives in Toga, so those topics are marked with a green flag. This map will help me quickly reference the topics and their page numbers in the study guide. The last map is a work in progress. I am only planning our Detectives in Toga journal entries one chapter at a time. Notice the little arrow next to the Roman Empire sibling topic that is linked to the Setting subtopic. That arrow is a link to a website that we will use to do more research about the Roman Empire as we read the story. 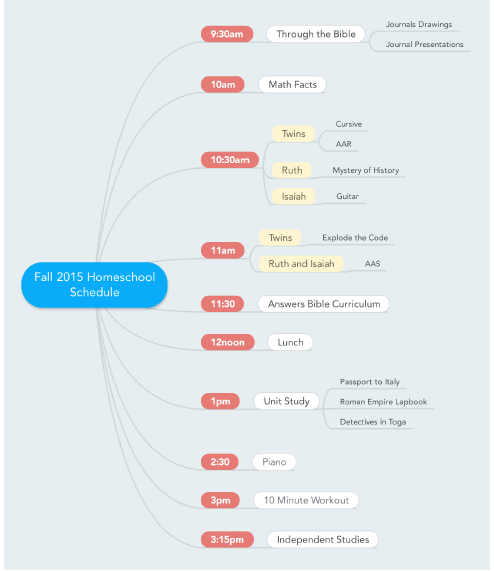 Besides homeschooling, I am also using a shared mind map to organize our Vacation Bible School. See! Even this left brained dominate, linear thinker has been able to organize all her marbles using mind maps. 1 Corinthians 14:40 But all things should be done decently and in order.